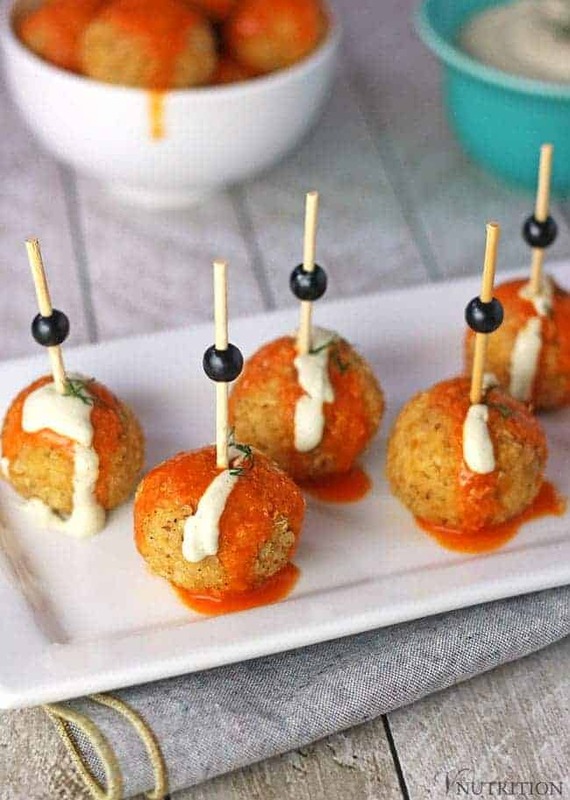 These Buffalo Quinoa balls are a great vegan option to get that hot sauce fix without any meat. They’re perfect for game day, parties or anytime you want a little kick! I love anything spicy. I try to hold back from making too many spicy recipes but I can’t help myself sometimes. 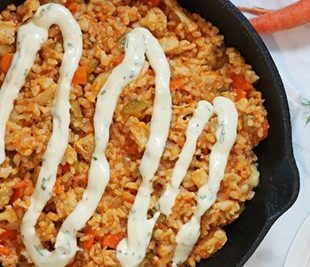 Some of my favorite recipes include a bit of heat like my Vegan Buffalo Chicken Rice Skillet and my Spicy Sesame Noodles (trust me, they’re good). Hot sauce has been a staple of mine since my undergraduate days. My roommate Alana was from Buffalo and Buffalonians always had some hot sauce around to throw on just about anything. Alana got me into that habit and now I carry around a small hot sauce in my purse just in case (don’t judge). My friend Kevin shares my love of Buffalo sauce and I wanted to make a vegan version of the sauce for Kevin who has been partaking in some of my plant-based recipes lately. 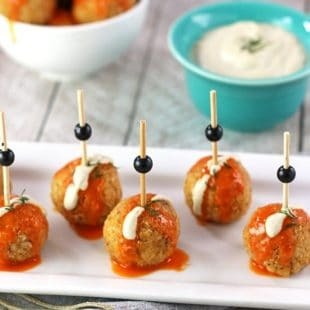 I really enjoy seeing people add vegan meals to their diet so I wanted to create a special treat for him that would give him a taste of Buffalo wings without any meat so I came up with these Buffalo Quinoa Balls. I’ve seen other bloggers use quinoa in burgers and I thought it might work in sort of a meatball shape as well and I’m happy to say it did! These Buffalo Quinoa Balls are versatile – I’ve had them as an appetizer, on salads, and as part of my main meals. The quinoa adds protein, carbs, fiber, and iron. I first fry the balls then bake them – the frying seems to help the balls stay together better since I’m not using egg as a binder. I also put the balls in the freezer for about 10 minutes before frying as well which keeps them in better ball form. I was never a big fan of blue cheese but I have always loved me some ranch so the dipping sauce is my take on a healthy ranch dressing using cashews. The cashews add protein as well as magnesium (which many people in the US are deficient in). 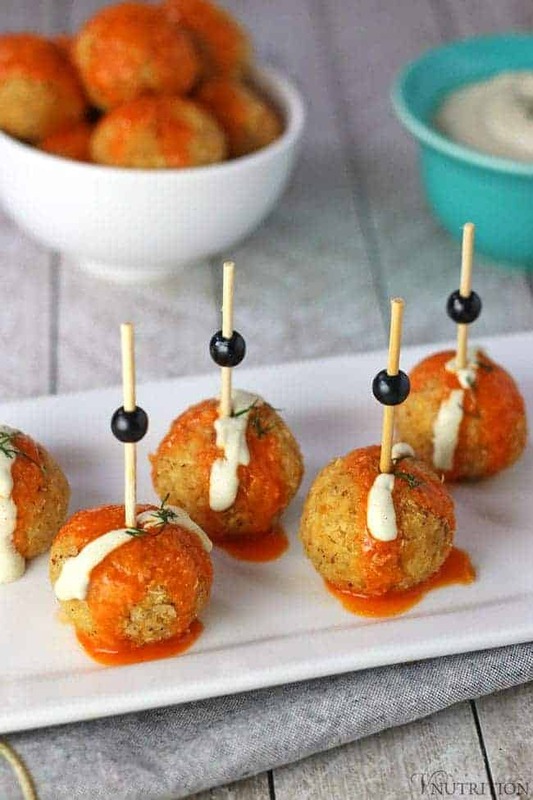 These Buffalo Quinoa balls are a great vegan option to get that hot sauce fix without any meat! Add all of the sauce ingredient in a small saucepan and heat until butter is melted and set aside. Add beans to food processor and mix until smooth (you may need to add a tablespoon of water to get it smooth). If you do not have a food processor, you can mash them with your hands but the texture will be a little less smooth. In a large bowl, combine the bean mixture, flax egg and 3 TB of sauce. Then add cooled quinoa, bread crumbs, nutritional yeast, pepper, onion powder, garlic powder and salt. Take quinoa mixture and form into about 1" balls (sometimes mine get a little larger). Put balls in freezer for 10 mins (optional but makes them stay together better). Heat 2-3 TB of oil (depending on how large you pan is) and fry quinoa balls for about 5 minutes flipping so that all sides get cooked. I usually do this in 2-3 batches. Place balls on cookie pan and bake for 15 mins. 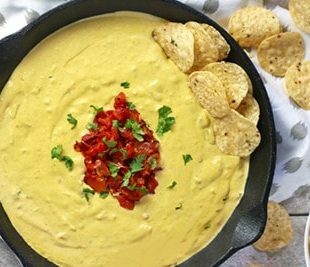 While balls are baking, make the ranch dipping sauce by adding all the ingredients to a high-speed blender and mix until smooth. When balls are done baking, you can coat them in the rest of buffalo sauce. Or what I like to do is keep them a bit more crunchy and only put the sauce on each ball right before I eat each one. *I have made the buffalo ball mixture the night before and they come out the exact same way. I recommend this if you're busy - this way you can just fry and bake them the day you're having them. *Ranch dipping sauce will be good in the fridge for up to 5 days so I pre-make this as well. * Nutrition info does not include ranch dipping sauce. Oh, this recipe looks so delicious! I love buffalo sauce anywhere, any time. This likes a perfect new way to enjoy it! (Oops. That’s supposed to say ‘This looks like a perfect new way…” My brain got ahead of my fingers! Haha, I actually read it the way you meant it! Thanks so much Cadry! I’m so obsessed with buffalo sauce and I’m so glad to hear someone else is too! Holy crap those look AMAZING. What a fun food to make. Terry would love these. I’m not a fan of hot sauce, but I might try to make them with bbq sauce. I know it probably won’t be the same, but I’ll give it a go. Awesome job on this recipe! I wonder how they’d be with bbq sauce. Let me know if you try them that way! I love buffalo hot sauce too! Love the idea of putting it on quinoa balls! Thanks Annmarie! Let me know what you think of them! So, a serving size is 20 of these?!? Just making sure against the nutritional facts and serving size you posted!! Hi Ellie, there’s 20 servings (20 balls) so the nutritional info is per ball. These look GREAT! I am so trying them out this weekend. Thanks Vicki! Let me know what you think! Oh wow, do these look good! I’m going to try these out on some of the meat-lovers in my family– I think they’ll like them! This recipe looks fabulous, love the ingredient list – never tried using quinoa! Thanks! I’ll definitely make these. They look amazing! With a husband obsessed with Sriracha sauce, I guess the Buffalo one could be a good alternative! Thank you for sharing! I’m obsessed with both sriracha and buffalo sauce so hopefully it would be a good alternative for your husband! I need to remember to explain things more about geography or US specific foods in my posts better now that I have more people coming to the blog from other countries! I love connecting with new friends form around the world! Ooo I love everything about the recipe! 🙂 I’ve only recently started doing ‘hot’ so I’ll see how it goes. Loving the quinoa balls 🙂 Thanks for bringing to the Plant Based Potluck Party this week. Love the Plant Based Potluck party! This sounds like such a great meal – I love the sound of the balls and the sauce! These look so good Mary Ellen! Pinned and can’t wait to be back in the kitchen to try them. Thank you for joining us for Meatless Monday! Thanks so much Sarah! Let me know what you think! These are perfect for my next club meeting! My friends will love these awesome quinoa balls. 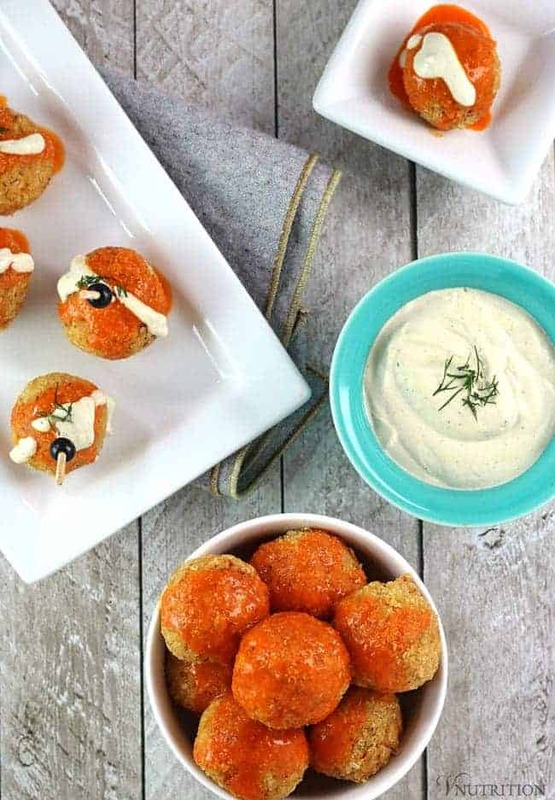 Thanks for sharing your healthy and delectable Buffalo Quinoa Balls With Ranch Dipping Sauce recipe with us on the Plant-Based Potluck Party Link Up. I’m pinning and sharing. Thanks so much Deborah! I hope your friends like them. Love these Mary Ellen. Thanks for submitting them to Meat Free Mondays, the roundup is now live and I feature them. Could I ask you link to the challenge in your post next time? If all the entrants do this hopefully all the recipes will be seen by more readers. Thanks so much for featuring these! Yes, I totally will link in the post next time! Oh and forgot to say, tweeted, pinned and tumbled your recipe. I love buffalo sauce a little too much 🙂 Thanks for linking up to Best of Blogs– tweeted and pinned for you. I love hot sauce & buffalo anything. I’m not quite keep a bottle in my purse status. But, if I ever start carrying a purse I think that will be an essential! I’m on a cruise and they have tiny bottles of hot sauce at breakfast so I’m taking some for home lol. I am a Buffalonian…born and raised! Love that you use Frank’s hot sauce, THE only real Buffalo sauce. This looks delicious, such a creative way to use quinoa! We’ll have to try this out! Thanks so much Janelle! Yes, Frank’s is the best! I have a tree nut allergy can you suggest a replacement for the cashews? 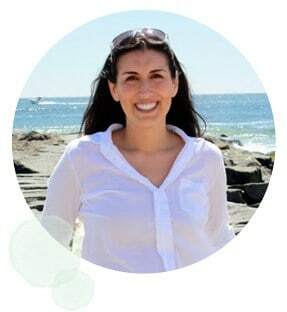 Hi Amy, Thanks for stopping by! I’m trying to think of what would work the same as cashews. 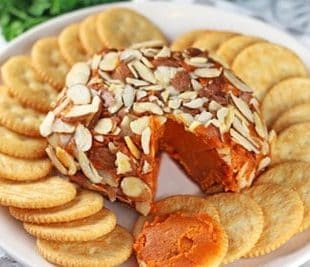 I have heard sunflower seeds are good to replace tree nuts but I’m not exactly sure if it would work as I have not tried it and they are a bit different in taste than cashews as well as creaminess. I just made these and they are ADDICTIVE! Thanks for the recipe! I’m so glad you liked them Suzie!! I had so many of them while playing around with this recipe and I still couldn’t get enough! do you blend the sauce ingredients until smooth? Hi Delia! I put all of the sauce ingredients in a saucepan and stir them. It gets smooth without having to put them in a blender. I am definitely going to try this recipe! I love Buffalo and Ranch! Buffalo & Ranch are my favorites! Let me know if you try them! Made these for Christmas Eve appetizers. I used gluten free breadcrumbs because my brother-in-law is Celiac. I am, however, the only plant based eater and everyone LOVED these!! My sister-in-law even asked for the recipe so she could make them for her NYE party for a group of omnis! Definitely a winner and will make again! Thanks for such a great recipe! These sound fantastic but can they be made in an air fryer instead of being fried in oil before baking? Hi Michele, I’ve actually never tried them in the air fryer before. The reason I fry them is so they stick together more when they’re baked. I’m wondering if the air fryer would so the same thing. If you do decide to try them in the air fryer, let me know how that turns out. I’ll need to try that myself soon!